Ed Howard, a pioneer area publisher, acquired a local newspaper in 1898. 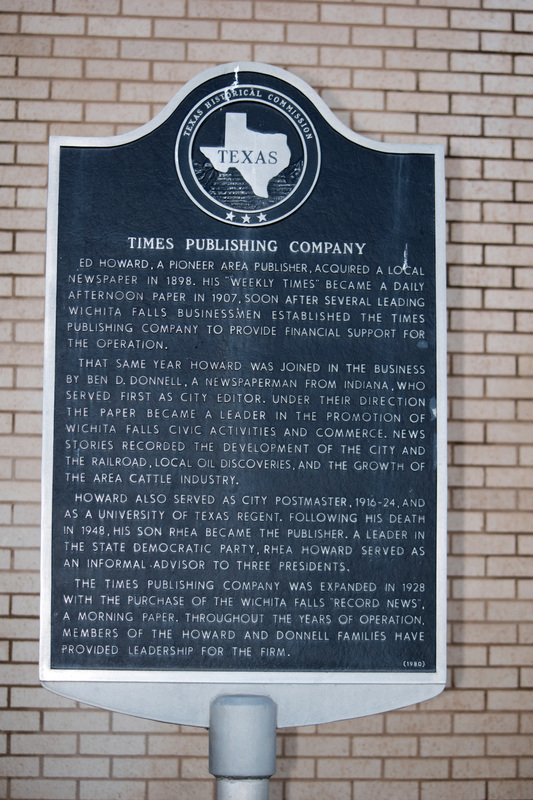 His "Weekly Times" became a daily afternoon paper in 1907, soon after several leading Wichita Falls businessmen established the Times Publishing Company to provide financial support for the operation. Howard also served as city postmaster, 1916-24, and as University of Texas Regent. Following his death in 1948, his son Rhea became the publisher. A leader in the State Democratic Party, Rhea Howard served as an informal advisor to three presidents. Located at 1300 Lamar Street, Wichita Falls, Texas 76301. GPS coordinates: 33-degrees 54' 22.7" -98-degrees 29' 20.4"
For information about the Times Publishing Company at the Handbook of Texas Online, click the button below.